A powerful current of imaginative insight propels this impressive first novel by feminist writer and human-rights activist Natasha Walter about double lives during World War II and the Cold War. 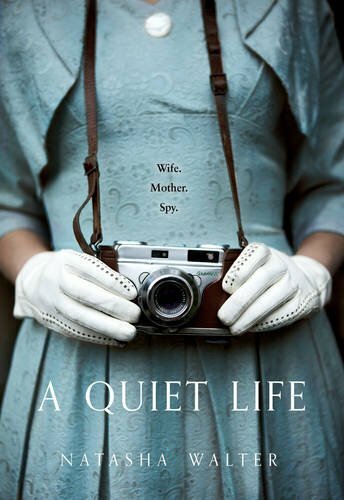 Ins pired by the life of Melinda Marling, American wife of British diplomacy’s golden boy, the traitor Donald Maclean, A Quiet Life follows the career of Laura Leverett, who follows her heart into a life of secrecy. Travelling to London by sea in January 1939, to stay with cousins in England, self-contained young Laura experiences for the first time the heady freedom of new encounters. She comes from a closed-off family, where disappointment and hidden violence have stunted interest in the world of politics and ideas. At sea, she meets young people of an altogether different kind: Florence Bell, a free-spirited young communist, and Joe Segal, a dissolute young journalist. In London, where she lodges with her cousin Winifred and is introduced to an elite social set, she observes the behaviour of the privileged. For a while, she moves between Winifred’s world and Florence’s world – between sophisticated London nightlife and country-house weekends on the one hand, and bedsits and political rallies on the other. The contrast,especially in the role of women, is stark. For a while, Laura swims uneasily in these two environments, learning to keep her own counsel. At one of the heavy-drinking parties, she meets British diplomat, Edward Last – a similarly watchful member of a charmed circle at the heart of the Establishment. The novel explores the consequences of their love-affair and marriage, throughout most of which, unknown to anyone except themselves and their Russian minders, both are engaged in betrayal. At first, adjustments have to be made. Edward is warned to break off with Laura, whose communist sympathies might blow his cover. Instead, Laura breaks off with Florence. She is then recruited to photograph and pass on information gathered by Edward. The pressure and danger are intense, as they maintain their exhausting roles: he the brilliant albeit alcoholic servant of his country, she the relatively shallow American outsider, given to chasing other people’s men. Scenes at the height of theBlitz on London are especially vivid. One of the strengths of Natasha Walter’s reconstruction of this period – before, during and after the Second World War – is her feeling for the strains and cracks in social, political and emotional life at the time. The party-goers survive on drink, drugs and debauchery, while still contriving to run the country. Privilege cannot see that it stands on a precipice. The attractions of Communism are made painfully clear, and Walter does not shy away from its contradictions. It is with relief that the reader follows Laura and Edward away from haggard post-war London to Edward’s new posting at the British Embassy in Washington DC in 1945 – yet here the strains continue. And how could they not? The danger also. It is an incredibly risky and lonely path they are on. By all accounts, one of the most remarkable features of the (all-male) Cambridge Spy Ring was that, for so long, no-one suspected them. A Quiet Life is an interesting addition to the literature on the subject: it explores the female experience and examines in depth the bitterness of secrecy.